Those of us fortunate enough to enjoy a long life will find some body parts don’t work quite as well as they used to. There’s nothing abnormal about having a stiff back or a bum knee in our older years, and most people find ways to adapt and get help with tasks they can no longer handle themselves. The brain is also a body part, subject to the same effects of time as any other. It’s not a pleasant thought, but cognitive decay is a real possibility as we age. For that reason, everyone should prepare themselves for the possibility of a change in their ability to make financial decisions. Identifying warning signs in yourself and the people you care about can mitigate the risk of poor investment decisions or exploitation by scam artists. Now, what some call “cognitive aging” others term “gaining wisdom.” After all, older people report higher levels of happiness and less anger and worry. Some cognitive abilities, such as vocabulary, are not impacted by brain aging and have been shown to possibly improve over time. Unfortunately, people’s knowledge of money matters doesn’t improve like fine wine. Research shows that individuals’ financial literacy typically declines by about 2% per year after age 60. Their financial self-confidence? That remains unchanged. And a significant gap between the two can threaten a lifetime of good financial habits. Studies reveal that people experiencing normal cognitive aging tend to experience difficulties in their financial judgment more often than in their ability to perform financial tasks. Accessing their money is just as easy, but making good decisions about what to spend it on and invest it in is harder. This is especially true for financial novices who weren’t responsible for managing their family’s accounts earlier in their lives. There’s no universal sign or timeframe for cognitive aging; it tends to be asymptomatic and doesn’t announce itself with great fanfare. But over time, changes affecting someone’s ability to perform regular activities—think driving, handling personal finances, managing medical prescriptions or a calendar—may become apparent. And it is key to arm yourself with some advance knowledge of the signals to take appropriate action where you can. 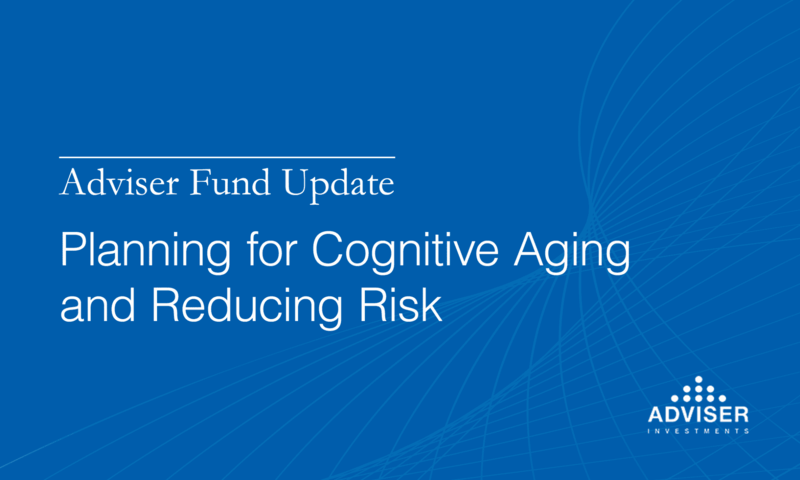 Based on our experiences as a firm, we’ve identified some early warning signs that cognitive aging could be impacting financial decision-making. Taking Longer to Complete Financial Responsibilities: Is it taking longer to prepare and mail bills? Is balancing a checkbook becoming more of a challenge? Is tax preparation more difficult and time-consuming than it used to be? Difficulty With Everyday Math: Potential trouble spots include difficulty determining the return on an investment, figuring out a medical deductible or a restaurant tip, or doing two calculations as once, such as making change. Signs of Reduced Attention: Is it harder to focus on your reading or processing of information? It could be difficulty identifying an overdue bill or the inability to concentrate long enough to find key details in a financial statement. This week, we covered some of the early warning signs of cognitive aging. In an upcoming Adviser Fund Update, we’ll discuss some commonly accepted wisdom on keeping the mind active, as well as some specifics on how to put a plan in place to protect your financial assets if you are ever unable to effectively manage them yourself. In the meantime, if you have any questions about the subject or how Adviser Investments can help you, please call us at (800) 492-6868 or email us at info@adviserinvestments.com. Is it possible to do well while doing good? Impact investing, socially responsible investing (SRI), environmental, social and corporate governance investing (ESG)—each shares the goal of producing financial returns while investing solely in companies that are determined to be morally or ethically sound. To find out more about socially conscious investing, we encourage you to download our exclusive infographic—a straightforward look at three common approaches, the benefits and potential drawbacks of ESG investing as well as an introduction to Adviser Investments ESG strategies. The infographic also contains a link to the latest episode of The Adviser You Can Talk To Podcast. “ESG Investing—Doing Well While Doing Good” breaks down the pros, cons and complexities of this investment philosophy that has become a popular topic on both Main Street and Wall Street. Click here to download our exclusive Socially Conscious Investing report today! On the topic of ESG, you may have heard that Vanguard is expanding its reach in the socially responsible investing space. Earlier this month, the firm announced that it will open its first actively managed ESG mutual fund around mid-year: Global ESG Select Stock. Vanguard already has two ESG exchange-traded funds (ETFs) in its stable, ESG International Stock and ESG U.S. Stock, as well as the aged FTSE Social Index fund. The latter, open to investors for nearly 19 years, has only accrued $5.1 billion in assets under management—making it an also-ran fund at the $5.0-trillion company. (Read more about FTSE Social Index.) While its other ESG funds are managed in-house, Global ESG Select Stock will be sub-advised by Wellington Management. The new fund will benefit from Vanguard’s low-cost mantra. Global ESG Select Stock’s Admiral and Investor shares are expected to charge expense ratios of 0.45% and 0.55%, respectively. This will make it one of the more affordable actively managed ESG strategies on the market. The average active “socially conscious” fund, according to Morningstar, charges investors 0.69% in fees. But wait: Vanguard’s press release also says that Global ESG Select Stock “may hold companies that would be omitted by some exclusionary ESG strategies.” This means that the fund’s managers will be making their own judgment calls about companies’ ESG-worthiness. In principle, this is a natural extension of an active management approach to a socially responsible portfolio. In practice, it might mean that the Wellington team’s ESG picks are at odds with your values or aversions. But this factor is at play with almost every ESG or socially responsible investment fund currently available, even if it does adhere to strict ratings guidelines. There is subjectivity inherent in the ratings, and ESG-inclined investors may have to make compromises in the funds they own to effectively pursue such a strategy. For our part, we think allowing fund managers the discretion to hunt for value wherever they find it is a good thing. We also completely understand that some investors simply can’t sleep at night if any part of their portfolio is invested in a company that’s incompatible with their beliefs. At Adviser Investments, to help our clients follow a socially responsible investing philosophy, we have developed two strategies that leverage our strengths as a firm. We apply our Active Acumen™ analysis to our ESG Core strategy to give our clients the benefits of our active management expertise in comprehensive, globally diversified portfolios of index funds and ETFs tailored to their risk comfort zones. And for investors who wish to invest in a stock-only portfolio, we manage an ESG Dividend Income strategy focused on high quality companies bought at reasonable valuations that are committed to growing their dividends. To learn more, please click here for our free Socially Conscious Investing report. Or give us a call! Adviser Investments operates as an independent, professional wealth management firm with expertise in Fidelity and Vanguard funds, actively managed mutual funds, ETFs, fixed-income investing, tactical strategies and financial planning. Our investment professionals focus on helping individual investors, trusts, foundations and institutions meet their investment goals. Our minimum account size is $350,000. For the sixth consecutive year, Adviser Investments was named to Barron’s list of the top 100 independent financial advisers nationwide in 2018 and made its list of the top advisory firms in Massachusetts for the seventh year in a row in 2019. We have also been recognized on the Financial Times 300 Top Registered Investment Advisers list in 2014, 2015, 2016 and 2018. The ESG Dividend Income strategy is managed by Braver Capital Management, an affiliate of Adviser Investments.